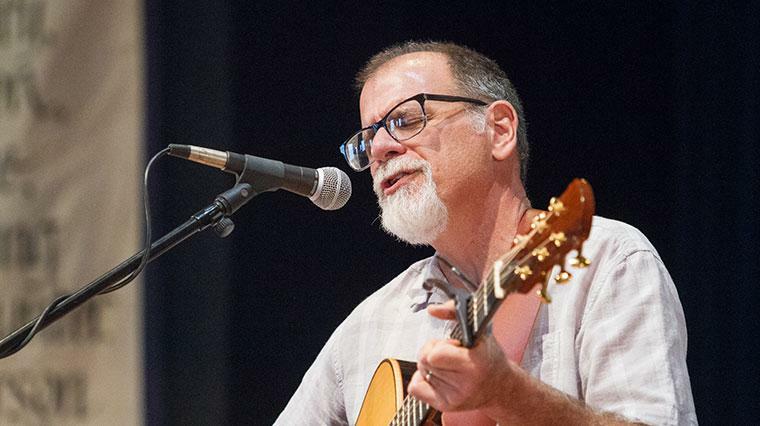 Dr. Jerry Holsopple, professor of visual and communication arts, shares some music he wrote during convocation. 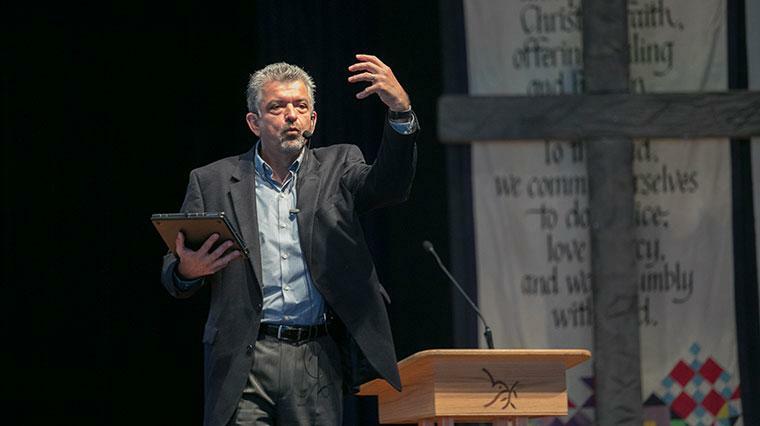 Dr Juan Martinez, professor of Hispanic studies and pastoral leadership at Fuller Theological Seminary, spoke about "walking into God's future" at convocation. 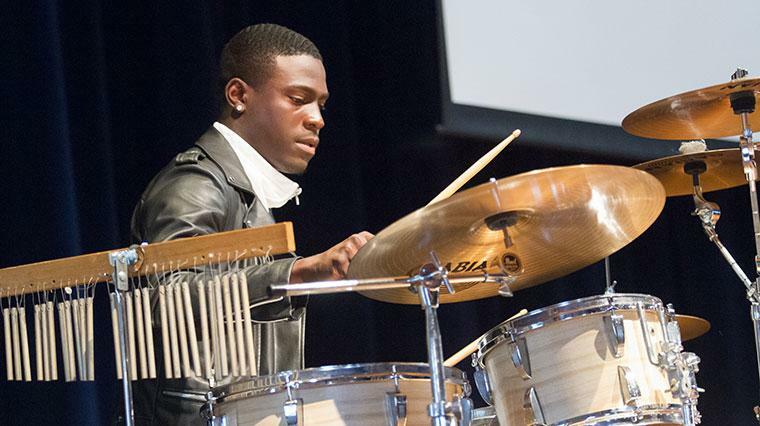 Students have an opportunity to lead or share music during convocation and campus worship. 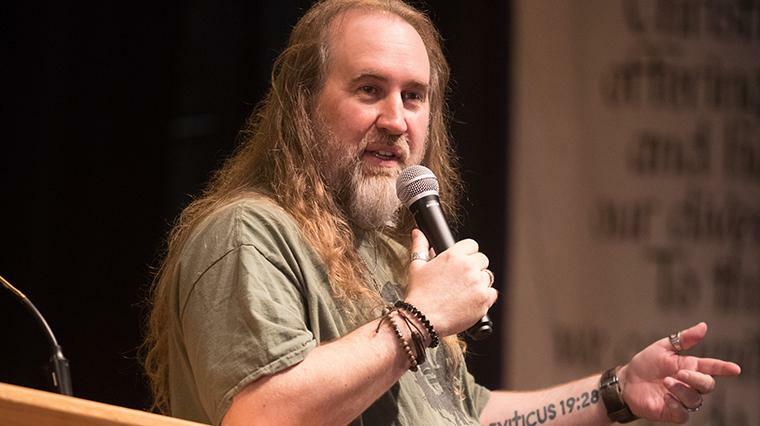 Bruxy Cavey is the senior pastor at The Meeting House, a church for people who aren’t into church. He spoke about "embracing our role in the kingdom." 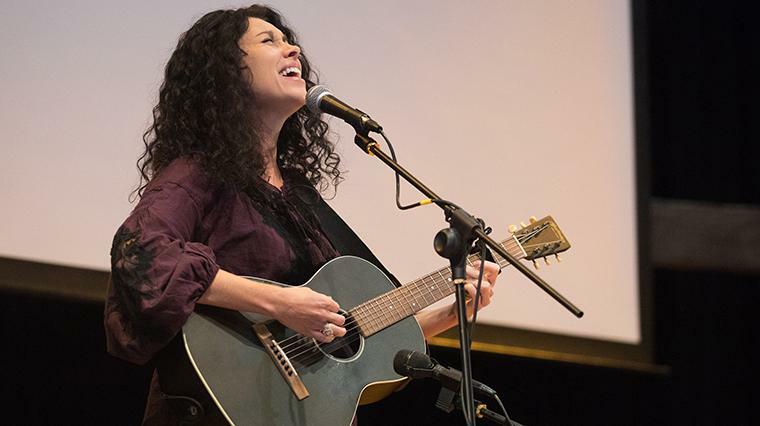 Jessica Crawford, musician, song writer and worship leader, sang in convocation. 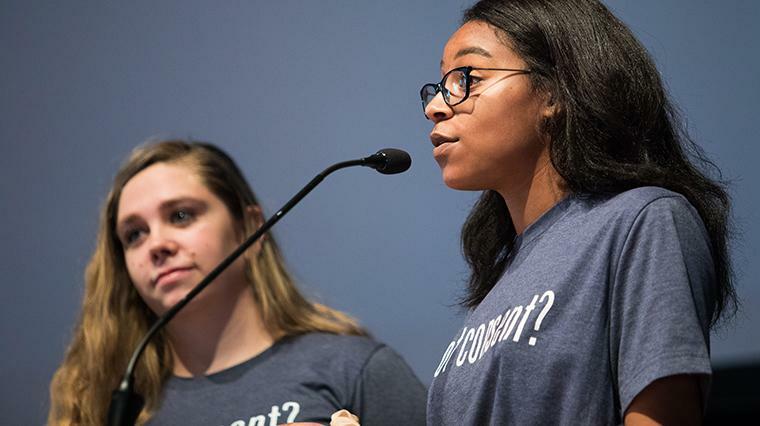 Students led a convocation for Take Back the Night, an international event and non-profit organization with the mission of ending sexual, relationship, and domestic violence in all forms. 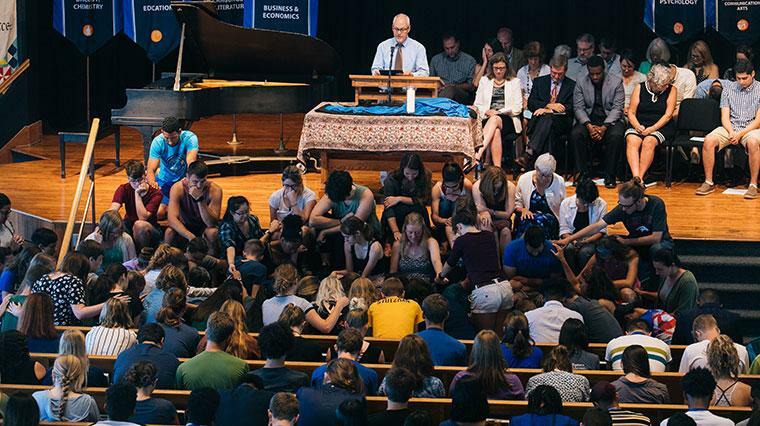 Faculty, staff, and students gather each Wednesday from 10:10 - 11:00 a.m. for either Convocation or Campus Worship/Convo Break-out Gatherings. Convocation is held every other week- a space for developing a sense of community in response to EMU core values and commitments. 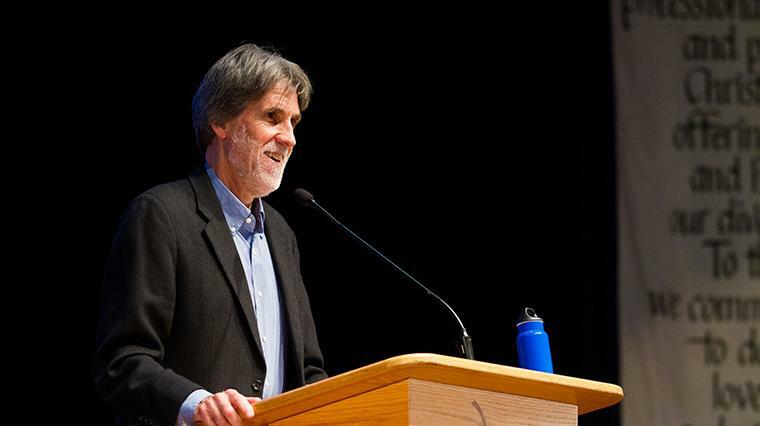 Speakers engage timely conversations and explore topics from a variety of Christian and interfaith perspectives. Campus Worship or engagement with a variety of Convocation Break-out Gatherings is held on alternating weeks- Campus Worship is a space for corporate community worship in a variety of styles over the course of the semester. Convocation Break-out Gatherings happen at the same time as Campus Worship. These groups are small group, topic-specific conversations. Use the request forms below to have your event considered for the convocation requirement or to request speakers or themes. Request for Convocation Event Approval- To request that your event be approved for convocation points use this form. Suggestion for Convocation Speaker/Theme- To make suggestions for a convocation speaker or theme use this form. Request for Convo Breakout Group- To request that a convo break-out group be approved to allow students to scan in for convocation requirement points.